Another beautiful morning and Brandon and I walk into another magnificent Domaine – a beautiful ivy clad house, just perfect for anything. We walk around the back to the cellar. Thibault is pouring samples from down below. He speaks perfect English and comes up to greet us. 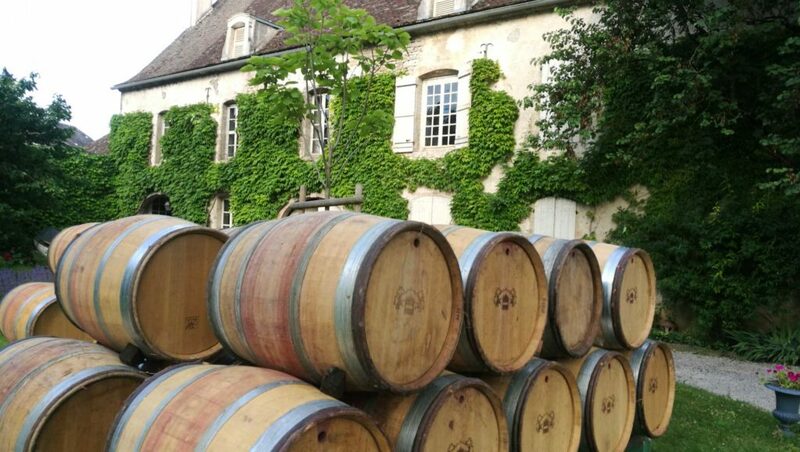 The Domaine houses some Grand Cru wines, but there is a new site where we will taste. We drive a few minutes to the most modern site we have seen in Burgundy. We then realise that Thibault is an incredible blend of the old and new and a fascinating character, respected by all. He shows us around the facility – proud and knowledgeable, he shows us solar panels, water reclamation and energy efficiency devices everywhere. The Domaine has been organic and biodynamic since 2001. 2017 Moulin à Vent Les Ruchots Beaujolais: Lovely fruit and spice, rounded body, medium concentration, fleshy. Sand and granite soil, 40% whole cluster. 2m of soil. 1ha Chambolle musigny 1er cru. 2ha Chambolle Musigny. Blend of 5 Lieux Dits. 40% whole cluster. Big clay with a mix of limestone soils. 2017 Vosne Romanee Aux Reales: Lots of limestone in this soil. Very aromatic, stony, mineral, lovely tannins. Very high vineyards. 70% whole cluster (cut at the stem). 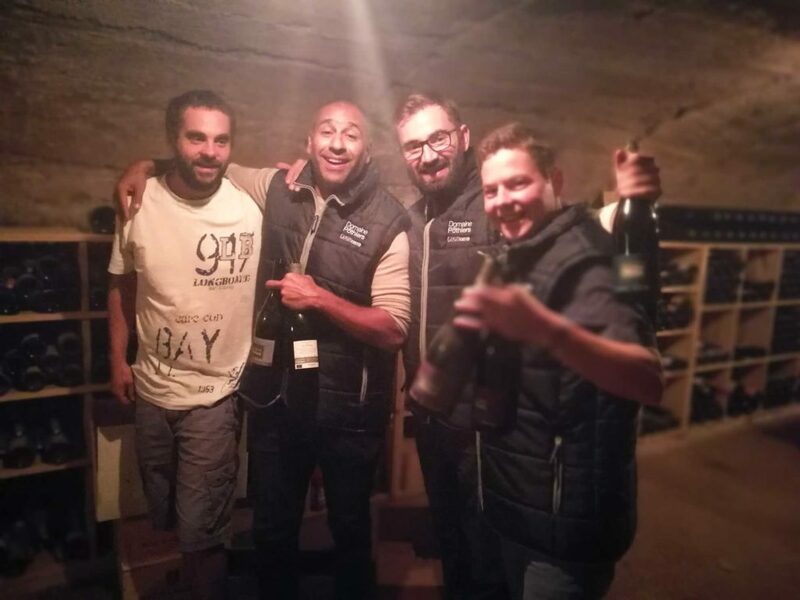 We walk down into the cellar to a group tasting with some Americans, Italians and Chinese. Alec has taken over the Domaine from his father. He is incredibly confident and respectful of his Domaine, and very knowledgeable of its history. 1996 Clos de la Roche Grand Cru: Red/brown colour. Gentler spice, toffee notes. Blending of flavours, gentle spice, silky graininess – delicious. Eva Reh Siddle loves her Domaine. 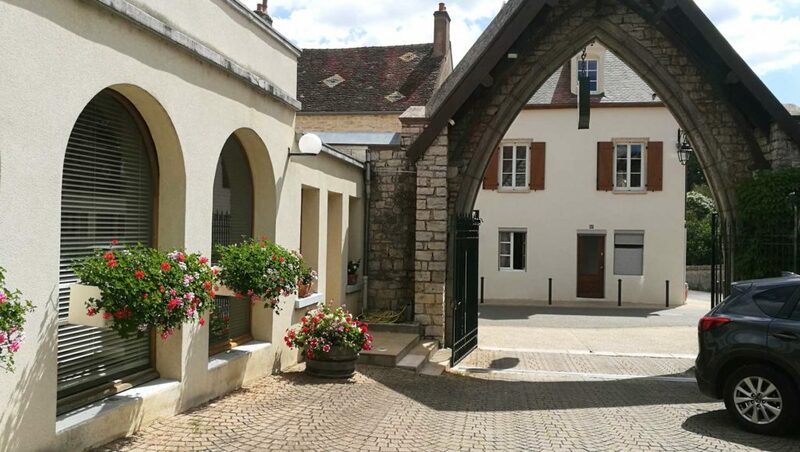 Nestled in the heart of Vougeot (next door to our wonderful hotel), her back gate looks at all of the greatest vineyards within touching distance. Amourouses to the right, Vougeot in front and Echezeaux to the left. Eva Reh is sophisticated and speaks her mind – maybe an element of her German heritage. It is clear that she loves the place, and that running the Domaine is a labour of love. There are 6 full time staff at the Domaine. She tells us the 2015’s are closed now and need another 5-7 years. The 14’s and 16’s can be drunk now. 50% oak, 50% stainless, 20% whole bunch. 2016 Vosne Romanee Les Beaumonts: Fragrant, soft, black fruit, hint of licorice, stony, pebbly. Used to be Pinot Noir until 1984. 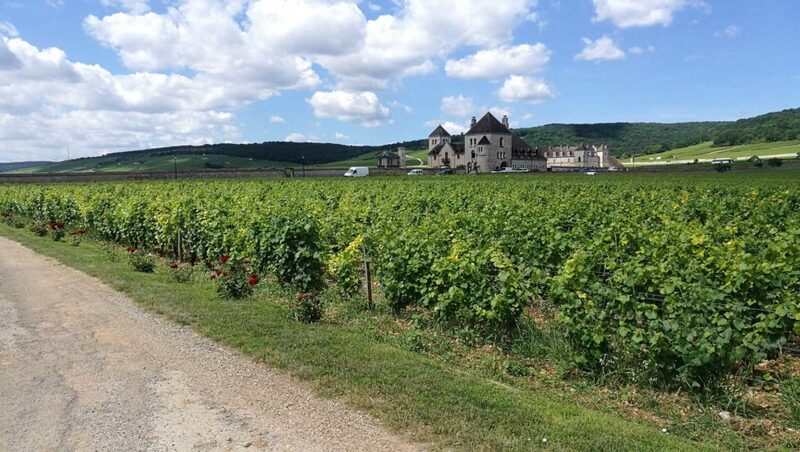 In the early days of the Monastry in Vougeot the land was equal and blanc and noir. First harvest was 1988. Brandon and I drive South from the Cote D’or. It is a fairly long distance to the Maconnais and in fact feels like a whole new region, even though it is still Burgundy. The hills are larger and more steep, the climate feels that touch warmer. 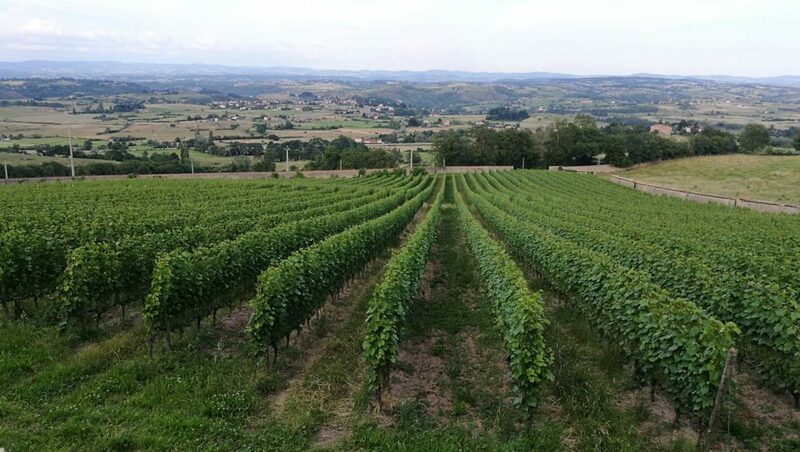 Vineyard elevations are 200-400m. We visit two Domaines in the Macon, housed in the same winery. 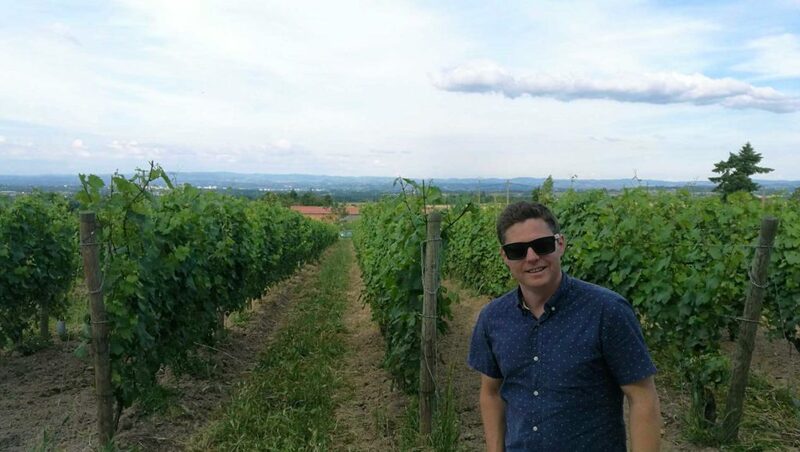 Guffens-Heynen is all their own vineyards and their own fruit. A total of 6ha: 1ha Pouily Fuisse, 1ha St Veran and 4ha Macon. All the fruit in Verget is bought in long term contracts with growers from the best sites. 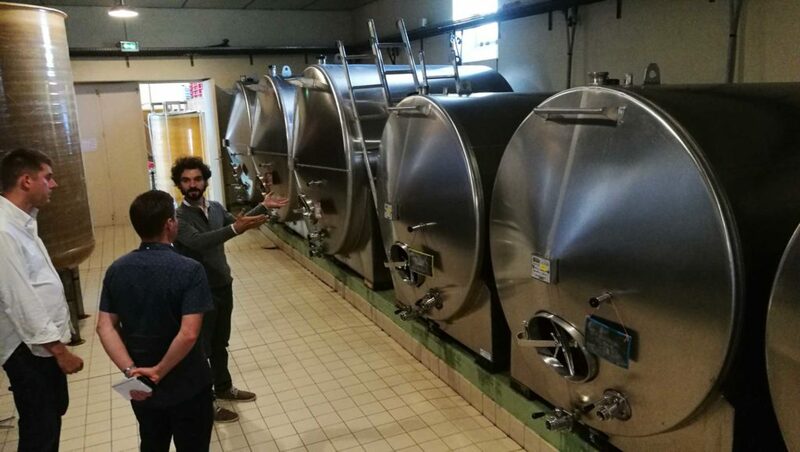 The Domaines are inspirational, technology is embraced, innovative wine methods are practiced – possibly the first in the world to use horizontal cylindrical stainless steel tanks for whites with a special lees stirring rod. The tanks increase the surface area of wine in contact with lees. There are many, many more innovations like this. We are shown around the facility by Julian who is intelligent, insightful and humble. All white wines. A blend of different plots in the village. High elevation, full eastern exposure. Limestone. 70 year old vines. 20% new oak – free run juice, low yields. From Vergison vineyards – high altitude. In a valley, North and South exposure. The Trie de Chavigne is the result of long harvests and the individual berries being picked at night over several weeks as each berry attains a specific ripeness. Brandon and I go off piste slightly. A long and winding drive up the hills, passing pretty villages, into practically the centre of France. We drive over the Loire river and realise that this region is actually a very far eastern point of the Loire Valley. It is intensely beautiful in a lonely far away kind of way. We feel like we can see the whole of France – North, South, East and West. The Côte Roannaise has been for wines for over a thousand years. We find the Domaine de Pothiers and the house at the end of a long driveway. An elderly gentleman stares frustratingly into the abyss of a tractor engine. We say Bonjour but he does not even know that we are there. Only the tractor matters. A few minutes later, the owner Romain drives up the lane with another tractor. He gets straight to business and shows us around his house which is at least one thousand years old and has housed his family for as far back as records go. We jump in the car and take a tour of his land. He takes us higher and higher to his Clos. An old monastery towers over this walled vineyard. We feel as far away from civilisation as is possible but the view is amazing – just beautiful. We go and see the rest of Romain’s property where we meet his horse that he plows with – they are best friends. Romain is truly a man of the country, up at dawn working till dusk, doing more projects in a year than I will do in a lifetime. He is truly inspirational and as we taste his wines we realise that we have found an absolute gem. Over an incredible meal with his family of the best beef in the world (home killed and cooked) we find out that when Roamain makes a rare visit to a 3 star Michelin restaurant he is treated like royalty, such are the quality of his wines and the respect he earns. I ask Romain what we should remember about his vineyards. 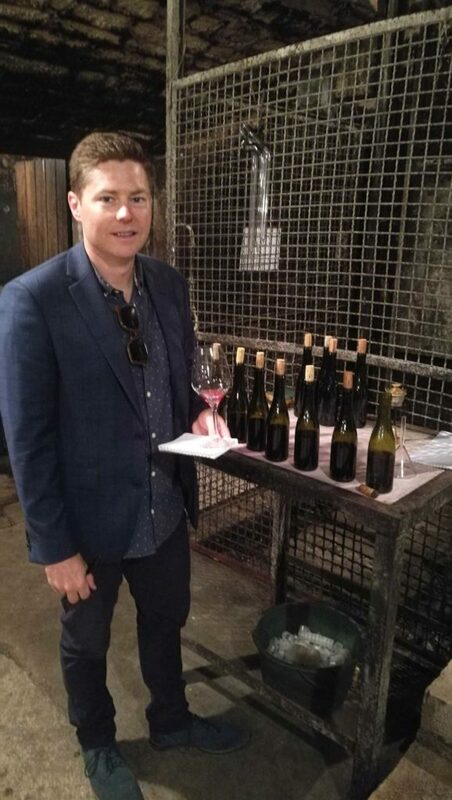 He tells me the Gamay St Romain (this is not the Gamay of Beaujolais – but a different variety altogether which is more pretty and feminine), freshness from altitude and cool climate characteristics. “Gamay forever” he says.